With post like Exploratory Testing: Recording and Reporting by Michael Bolton in which he links to an article and some slides of his about using notebooks to store your thoughts and notes in, and in particular the Moleskine. I have tried keeping notes and such on paper in a book, my biggest problem is that my hand writing is shocking and a lot of time even I have issues deciphering it later on. 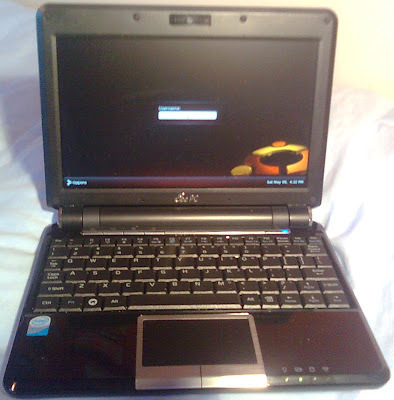 I have started to use to my eeePC 901 to start taking notes on. Well I am getting over five hours of battery on it with the WiFi off which is fairly handy to do what you need to do with going to a plug. Well with Ubuntu 9.04 I am getting about 35 seconds to the login screen and 10 seconds from the login screen to the desktop. Well I do still have a a book next to me so I can still draw while I am going along and just make a note that I have a diagram in my book. Well have autosave turned on to save every minute so the chances of losing something is fairly low. I do admit the small keyboard is a bit of pain especially seeing I am use to using a MS Natural Ergonomic Desktop 7000 but I am just writing notes rather than long documents so it is alright. If am using it at a desk it is easy enough to plug in a second keyboard into it. What is really nice about using a text editor is that it is really easy to put in timestamps into your testing notes. This comes in really handy when you need to come back and look at logs so can tie things together easyly. Text is nice and easy to read and can do spell checking though that can be a bit of a pain seeing I use a lot of shorthand, acronyms and technical words which aren't in dictionaries. One thing they both lack is not copy and paste and no insert of screen shots directly into your notes. I have always had a text file on the computer and also directory for screenshots and logs. So why don't I just use the computer I am and write notes there? Will I like the idea of the computer sitting to my right is my notebook and is for taking notes while the computer directly in front of me is working on. Other things like remote desktop can capture alt-tab which makes switching between servers and local text files a bit of a pain.